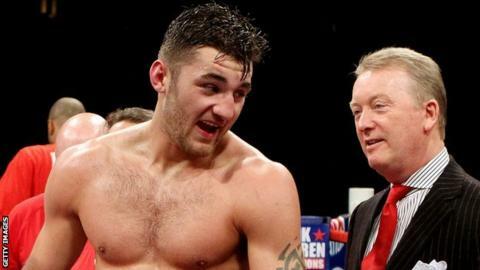 WBO champion Nathan Cleverly has warned his light-heavyweight rivals that the longer they put off facing him, the better he is going to become. The 25-year-old Welshman says the likes of American great Bernard Hopkins and WBA light-heavyweight champion Beibut Shumenov have turned down fights. "I'm still quite a long way off my prime," Cleverly told BBC Sport Wales. "There's no rush into these big fights even though I would fight them now and we've tried to make these fights." Cleverly, who will make his fourth title defence against Ukrainian Vyacheslav Uzelkov in Cardiff on 27 October, continued: "The longer it goes the stronger I'm going to get and the better I'm going to get, so that gives me great confidence. "I've offered many fighters the opportunity to take me on for my world title. "Bernard Hopkins and Beibut Shumenov are two big names in the division and I was prepared to travel to America to take on those guys, but unfortunately they passed. "Shumenov couldn't find a TV deal to stage the fight so we offered him the fight over here, offered him big money, but he's decided to turn that down. "I can take it as a positive because there's a reason why these fighters don't want to fight you and that's because I'm difficult to beat. "I'm unbeaten and when I'm mentally focused 100% I'm going to be very, very difficult to beat." WBO intercontinental champion Uzelkov - whose has 27 wins from 29 fights with 16 stoppages and is nicknamed Steel Power - will face Cleverly at the Motorpoint Arena, the scene of the Welshman's last defence against Tommy Karpency in February. "My opponent is very strong, he can punch and he'll come to fight," Cleverly added. "He'll come to take me on, take me out and try and get the knock-out victory." Cleverly's promoter, Frank Warren, claims he also offered IBF super-middleweight champion Carl Froch £1m to step up a weight division and fight Cleverly. "We made a written offer to Matchroom [Froch's promoters] of a million pounds to Carl Froch for him to fight Nathan for Nathan's title," Warren said. "We could have done it at a catchweight. They declined. "We got an email back saying he was going to continue fighting at super-middleweight, so that was that." Warren also revealed details of the negotiations that had taken place to try to lure Hopkins and Shumenov into the ring with Cleverly. "We were talking and agreed terms to go to New York in November to fight Bernard Hopkins, but Hopkins, apparently, didn't want to know, so that got knocked on the head," Warren added. "With Shumenov, the WBA champion, we actually agreed the unification fight and agreed we'd go to Vegas where he's based, but unfortunately they couldn't get a TV date and then they didn't want to come here. "They are the three big names we really tried to get something sorted out with, but unfortunately it was not to be. "Hopefully we can get to resurrect them in the new year if Nathan comes through against Vyacheslav Uzelkov."